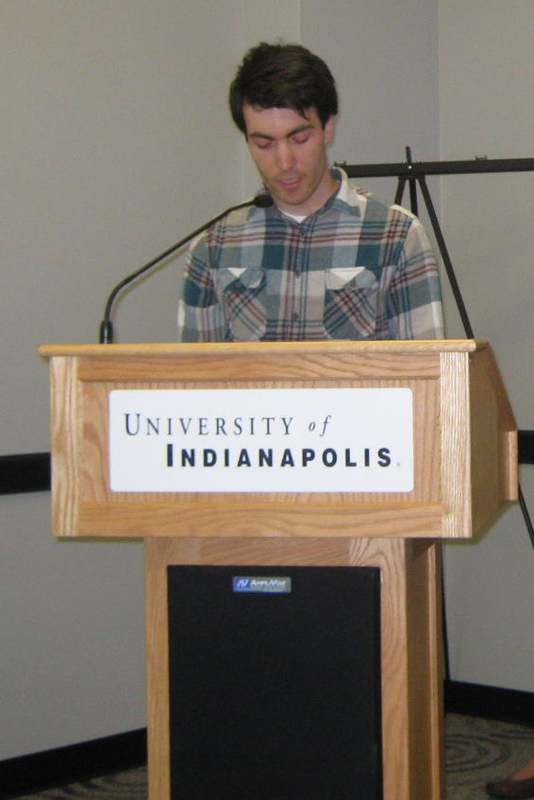 Here I am at the official-looking podium, wearing official-looking flannel. I am lecturing at UIndy about my trip to Europe in 2011! Not really. But I am reading my poem “Paris” (the 3rd prize winner of the university’s poetry contest). I wrote this poem about one day that my girlfriend and I were walking around the city. We had visited the catacombs, La Tour Eiffel, the Louvre and Musée d’Orsay during the previous days. The day that inspired this poem was a loosely planned stride around la ville d’amour, including a long walk along the river. That day we ate at a panini shop off some side street near the Seine. I have no idea where it was exactly. If I went back and tried to find it, I would probably feel like I was in Woody Allen’s Midnight in Paris. At this restaurant, though, Stephanie and I had the best vegetarian food after leaving England a week prior. France is big on food, so long as you eat meat. at a man with striped sweater and baguette. paying in camera clicks on les Champs-Elysées. whose sidewalk splendor burns soul and shoe. like a bear cave—ours brun ou noir ou gris? we climb up, car il n’y a pas d’ascenseur. where National Geographic says people party? and some sign informs: St. Michel/Notre-Dame. outside former train station, Musée d’Orsay. better service and cost, Orangina in a tab top. want to yell—Vous êtes le plus Américain! There was some spotlight in the sky that night. Below the Seine is lit up by boats. The people riding in said boats must have been blind, or ended up that way afterwards. I opted out of ending the poem with a melodramatic Fin. 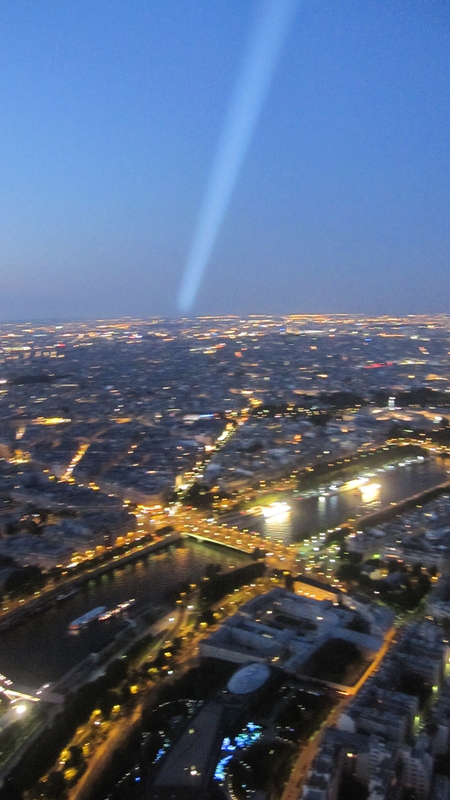 Although I do not have a photo of the situation that the poem describes, I do have a picture of the Seine from the top of La Tour Eiffel. It was freezing up there. But I could have warmed up with a glass of champagne for a mere 30 euros. I was a cheapskate and opted out of that as well. However, the forty couples that got engaged up there sprung for drinks. Hey, if you already spent a fortune on a ring and a trip to Paris and sweated out the stress up to that instant, you probably deserve (and definitely need) a drink. Am I right?